To understand the mechanism behind the movement of a walker robot. ‘’An industrial robot is an automatic, servo controlled, freely programmable multipurpose manipulator with several areas for the handling of work pieces, tools or special devices, variably programmed operations make the execution of a multiplicity of tasks possible”. The study of robots and its technology is known as robotics. Robotics deals with research and development in number of interdisciplinary areas including kinematics, dynamics, control, motion planning, sensing, programming and machine intelligence. Humanoid robots which is used as a tool for human. Humanoid robot that has human like shape. HADALY-1 and HADALY-2 developed by Waseda University-Helps to study human-robot interactions. WABIAN- humanoid walker robot from Waseda University. Creation of effective locomotion for legged robots is a difficult task. Providing sufficient locomotion ability to robots is a key element for its designing process. This will ultimately help them to carry out useful tasks in a variety of environments. The difficulties in controlling locomotion have shown to be an interesting area in which robotics and neuroscience interact effectively. The interactions were mainly seen with robotics taking advantages from biology in terms of morphology, types of movement and other related control mechanisms. Meanwhile, robots have been used in biology as a scientific tool to analyze and understand several biological hypotheses such as extinction of animals. Recent research works on locomotion control of robots focused mainly on trajectory based method. According to this method, the trajectory for every joint can be calculated using the inverse kinematics theory, in such a way that the robots where able to walk and keep their balance simultaneously. During the walking process, robots walk depending on the pre-designed trajectories. The trajectories can be attained by experience or some offline optimization method. But the limitation is the pre-designed trajectories are unchangeable. Recent research on walking gait has shown Central Pattern Generator (CPG) as a neural network which is responsible for generating and modulating walking patterns and others specific to rhythmic motion. It is located in the in the neural systems, specifically below the brain stem in the spinal cord. Different types of CPG models have been built and that have the ability to control rhythmic motions for robots. It produces basic rhythmic signals by itself. These signals are later passed to muscular-skeletal system by motor neurons that generate a movement. This biologically inspired control system has been found to suit for controlling robots with multiple degrees of freedom as it can produce coupled control signals for all joints. One of the typical Neuron CPG model is the Hodgkin-Huxley (H-H) type model. Legged robots represented a field of increasing research activity over the last few years. The flexible bodies of such robots help them to simply step over any obstacles and can walk through the rough ground, thus easily compact with complex surroundings. Remote triggering of walking robots involves complex mechanical systems that require further simplications. So it is critical to design a walker robot with model accuracy. The man-made robots can move by themselves, the motion must be modeled, planned, sensed, actuated and controlled and whose motion behavior can be influenced by programming. 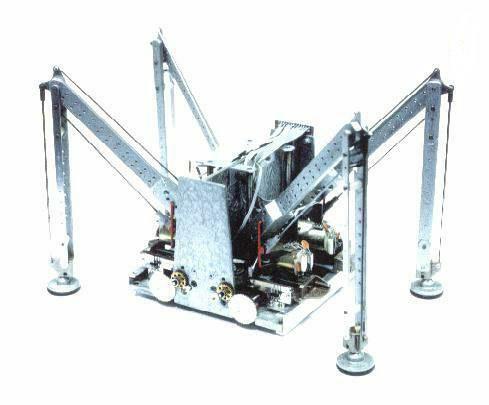 Large walking robots have the advantage of large power supplies and heavy electronics. Neuronal microcircuit is a network of biological neurons. Analog neurons in networks mimic the biological neural network. In other experiments, we have seen analog neurons and its properties. Here we are describing about different states of quad core network using simple electronic components. BEAM walking robots contain Nv networks, which consist of NV neurons each of which is a very simple oscillator setup. In previous experiment, Light sensing process in a neural circuit (http://vlab.amrita.edu/?sub=3&brch=257&sim=1321&cnt=1) we have gone through Nv network and it’s working. The Quadcore consists of 4-Nv net. It’s a micro core topology. 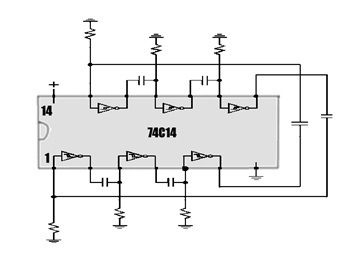 Here we use 74C14 Schmitt trigger i.e., which acts as oscillator and offers a Schmitt's hysteresis ensures a clean transition. 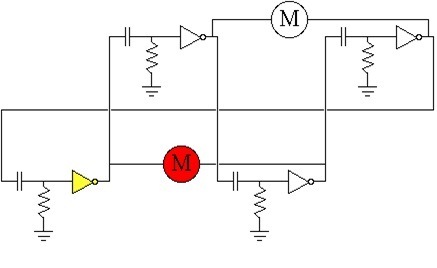 This is achieved by connecting a single RC integrating circuit between the output and the input of an inverting Schmitt trigger. 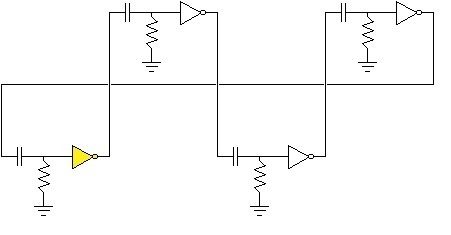 The output will be a continuous square wave whose frequency depends on the values of R and C.
In a 74HC14 Schmitt trigger, the Schmitt input guarantees a single output transition when a Nv switches, which keeps it out of saturation. On the other hand, a microcore (or 6 Nv or 8 Nv core) made “74*240 inverters will also "work" but will quickly saturate from noise picked up in the transition region. Since 4 neurons will enable you to drive two motors in both directions, the most-common use for a quadcore circuit is as the motivating force behind a walker.